This is probably one of (if not THE) best Gilt City deal I’ve seen in the workout world recently. Shred415 UNLIMITED classes for only $100. SweatyReviews lives for a good Shred class, but at over $25 a class it can get expensive. This is the perfect deal to start shredding at an affordable rate! Click the link HERE to purchase! You have to check out this Gilt City Flywheel Sports deal! Please note this is valid for new students only. Taking place in the signature stadium-style studio, Flywheel classes incorporate rhythm riding, hills and sprints to mix up your workout and maximize calorie burn. Top-tier instructors curate energetic playlists to help you stay motivated (and have fun). Flywheel provides everything you need for a comfortable sweat session, including freshly laundered towels, lockers, showers and changing sessions. There’s even a retail boutique for some post-class shopping. Checkout this awesome deal for Studio Three! TWO WEEKS of UNLIMITED classes! A new kind of fitness studio, Studio Three offers something for every fitness lover. Located in the historic former Erie Hotel, this stylish and state-of-the-art spot sprawls over three floors, each specializing in a distinct form of fitness. On the lower level, you’ll find the interval studio, where instructors blend functional warm-ups and active rest with explosive moves and calorie-torching intervals. Sessions here use advanced sound and lighting systems alongside equipment like Woodway treadmills, water rowers and loaded movement technology to boost performance, raise metabolic rates and banish workout boredom. On the main floor, students pedal it out during 45- and 60-minute cycling classes. These sessions combine Peloton bikes with nationally renowned instructors. The only Peloton live broadcast studio outside of New York City, Studio Three inspires you to succeed with tracked metrics, intense intervals and motivating instructors. A reprieve from the lower levels’ hard-hitting beats and intense circuits, the top floor’s yoga studio welcomes students to leave it all on the mat. Airy windows, rustic brick walls and sleek wooden floors set the tone for rejuvenating classes ranging from hot yoga and active athletic yoga to more relaxed restorative sessions. After invigorating body and mind, celebrate a job well done with a cold-pressed juice from Real Good Juice Co. on the main floor. You deserve it. Give the gift of Shred415 this Holiday season to yourself or someone you love with this amazing skinny deal! Two weeks of unlimited shred classes means you can ENJOY THE HOLIDAYS WITHOUT THE GUILT! Available to all new and existing clients. Applicable at all studios. Deal of the week at CorePower Yoga! Buy 3 month unlimited membership for $225 (Regularly $479)! Get it while it’s hot! This deal is only available through November 18th 2015 at Giltcity.com !! Here are the locations and schedules and Here are the class types! Enjoy! We came across this deal on Groupon and had to share it! If you live in the Lincoln Park area, there’s no excuse not to take advantage of unlimited cycling at Full Pscyle Chicago near the Depaul University campus. Full Psycle Chicago is an indoor cycling studio that uses high end technology to display exactly how fast and how hard each student is churning. The class takes place in a dim lit studio where cyclists compete against themselves and each other for a little healthy competition. The high-intensity spin class claims to burn up to 800 calories per session. The Fine Print: Promotional value expires 90 days after purchase. Amount paid never expires. Valid for new monthly members only. Limit 1 per person, may buy 1 additional as gift. Limit 1 per visit. Must activate first class by expiration date on voucher; classes expire 1 month from activation date. Not valid with any other offers or specials. Reservation suggested. Merchant is solely responsible to purchasers for the care and quality of the advertised goods and services. Never tried one of these super toning classes before? 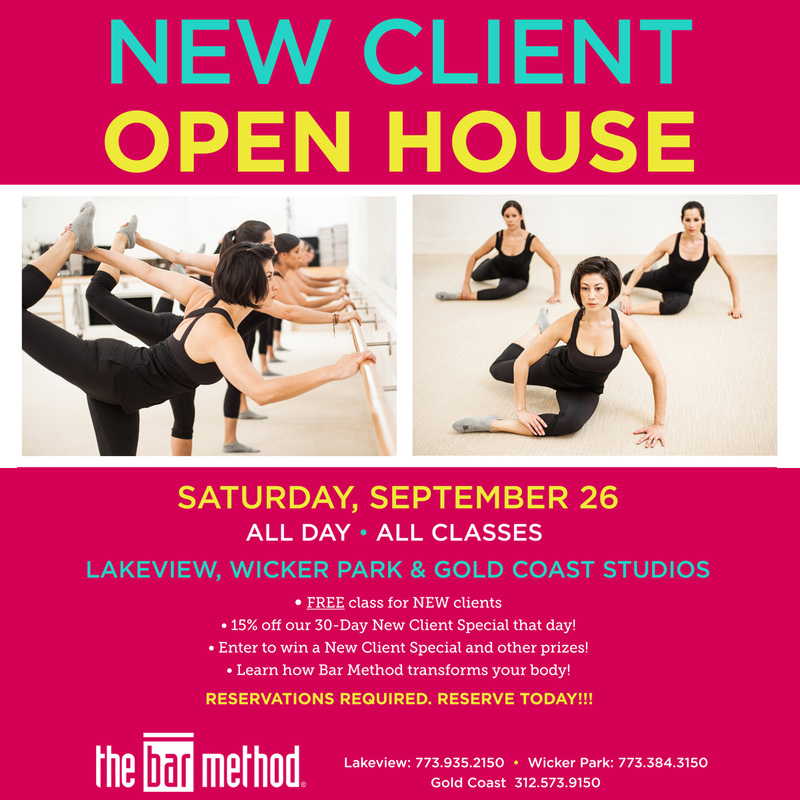 Check out the The Bar Method’s Fall Open House for new clients on September 26. The open house will be held during all classes at the Lakeview, Wicker Park, and Gold Coast studios!